The gift of music, simplified. 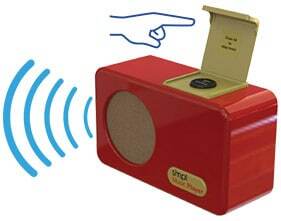 Highly durable consisting of a strong wooden enclosure with a high strength plastic covering. Out of the box pre-loaded with 40 big band hits from formative years. Simple Music Player enables seniors, even with significant cognitive decline, to listen to music from their formative years to engage their minds. Familiar music is widely recognized by healthcare professionals to improve cognizance (knowledge and awareness), lucidity (clarity of expression) and promote independent living and therefore improved quality of life. Extensive trials have verified that the simple Music Player operation is highly intuitive and does not require any prior knowledge or memory to start and stop the player. 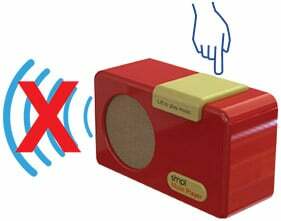 Once installed, the user operates the simple Music Player at will without any other requirement than to lift or lower the lid to start or stop the music. The only other control available for the user is a large button which skips to the next song when pressed. Pre-loaded with 40 Bing Bang hits, or a family member/caregiver drags and drops specific songs (MP3 format) and sets the volume level. 25-40 songs is often sufficient, but up to 1000 songs can be uploaded. The gift of music- Technology Made Simple by smpl. Problems…solved. Intimidated by technology: Nothing new to learn. Simply lift lever to play music. Q. I use an Apple MAC. I’ve deleted some files but they still play. How do I delete them? Q: Does it work in the USA, UK, Europe, Asia or Australia? A: Units are supplied anywhere in the world. They are configured to have the correct mains adapter to suit the dispatch address on our order. Q: How many tunes can be uploaded? A: The internal memory is set at 4GB. Obviously the length of individual songs has an influence on the capacity. To some extent this is an academic question since most people with dementia are more than happy with a much smaller song list of say 25 to 40 tunes. Q: Can the tunes be preloaded? A: No. The unit comes pre-loaded with up to 40 big band tunes, but we are unable to add additional music to the player for you. A: There is a headphone socket provided in the rear of the unit. Plugging in headphones immediately cuts out the main speaker. The socket is the light green one, the same as on your computer. Q. Dad can’t move his hands very much. Is there any way he can use it? A: We have provided two sockets in the back panel which over-ride the ’ON/OFF’ and ’NEXT TRACK’ controls. Switches from OT suppliers are readily available but please remember this does require a higher level of cognizance to operate than many people with dementia. Q: Does it upload from Apple devices? A. Yes, SIMPL Music Players bought since June 2015 have an Apple compatible USB interface. It can handle the .m4a file format directly from iTunes (Please note that it is not an Apple device so it cannot play ‘Apple protected’ .m4p downloads). Q: I’ve reformatted the player, transferred the disk and now nothing plays? Q: I do not have files in MP3 format. What do I do? Q: When I use remote switches it stops when I press switch, but starts when I release is again? A. You have the main lid open. To use external or remote switches ensure the lid to be in the down position. A: We purposely don’t have a shuffle function due to our front end research. The intent of the music player is to leave it permanently plugged in so that it plays in a complete loop (and doesn’t require the additional operation of plugging the power in to make it work, for the person with dementia). Generally we have found that most people with dementia only require between 25 and 40 tunes and the familiarity of the cycle is more positive than a random choice. When it is stopped by lowering the lid, it will restart from that position (i.e. not from the beginning). Obviously, as a cognizant person, if you keep switching it on at the mains and it starts playing the same tune it becomes monotonous, but this isn’t what we’ve found with people with dementia. The continual loop of familiar music is far more associative than a random shuffle facility. The requirement for ‘shuffle’ tends to be the desire of a fully cognizant person, not the intended user. Q. How do I delete the pre-loaded music? A.The SIMPL Music Player looks for and plays all the comparable files it finds on its internal memory regardless of which directory of folder they are in. 2) Reformat the SIMPL Music Player memory card (this will delete everything on the SIMPL Music Player) and then drag and drop the music you want back on to it again. See below for reformat instructions. Q. How do I reformat the SIMPL Music Player memory card? A.The SIMPL Music Player acts exactly the same as if it’s a USB stick or flash drive plugged into your machine, so formatting is just the same operation. You must reformat using fat32 option – other options will not work. Recreation Therapist loved the item and said that it was working for its purpose. Mother is thrilled to have her favorite music so easily accessible. All she has to do is “open” the music player to listen and “close” it when she’s done. Loading mp3 files from my computer onto the player’s drive was easy, and she now has several hours of personally curated tunes. It brings so much comfort with no confusion about which button to press. I highly recommend this product. I bought one of these for my Dad. The unit arrived quickly, it was easy to add a library of my Dad’s favorite tunes, and he loves it! No problem getting him up to speed with the unit. Sounds great. We are very happy! The plyer was easy to set up, easy to load new music and it sounds terrific. Very happy with our purchase! The music player is a wonderful gift for someone that has sight challenges! My dad was beaming with joy as realizing he could easily function it and bring his favorite big band music to fill the room. Customer service (notably with communication and shipping) was excellent . We gave this gift to my mother for her birthday in July. She is still raving about it. She loves to listen to the music and its ease of operation allows her to do so on her own whenever she pleases. I would recommend this product for sure. This was exactly what my grandma needed. Although she does not have Alzheimer’s she is unable to manage most music players. We needed something basic that we could upload her beloved country hymns to and this is it! One thing to note is that if you are using a Mac, to delete any songs you must empty the trash on your computer while the player is connected, otherwise, the songs stay on the player. I CARE FOR A NON-RELATIVE WHO LOVES MUSIC . I THOUGHT THIS PRODUCT WOULD HELP HER WITH THE FRUSTRATIONS OF LISTENING TO SOME OF HER FAVORITE SONGS. My dad loves this. He can use it himself. We are very happy with it so far. Mom is able to turn it on and off easily. Now that she can have her music easily accessible she is very happy. A member of our family has early stages of dementia. The symptoms she displays the most is repeating herself, short term memory is poor, and when younger was the best cook, now she cannot do this anymore. The one thing she has always loved to do is sing to the old tunes. When I found this radio I thought I was going to have load music, which I can, but it comes with great big band music and the sound is fantastic. Easy to use out of the box, plug it in and lift the lever. It looks old fashion which may make it appealing to her.